NEVER LOOK DIRECTLY AT THE SUN WITHOUT A FILTER!!! We're in the process of developing an educational program on the sun, and this page will keep you up-to-date on what we've got so far. First, we hope to start stocking "eclipse glasses" in our gift shop. These are specially designed glasses (cardboard frame with specially treated film lenses) which enable you to look directly at the sun. They are currently available from two sources (Rainbow Symphony and American Paper Optics), and we don't know which one we'll be going with for now. Either one is safe, but should be used with adult supervision. Secondly, we hope to start a "Solar Observation" program. 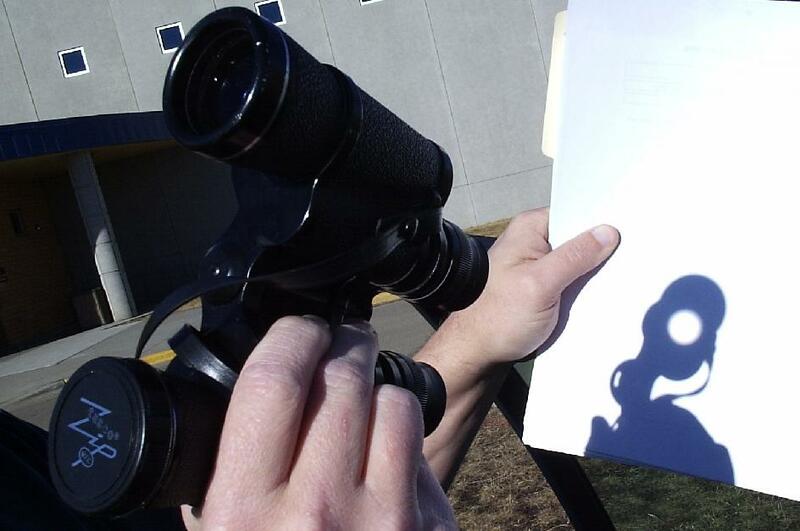 Using either the eclipse glasses, a solar projector (solar projection in action), or a solar telescope or solar binoculars, we'll give out worksheets where you can write down your own solar observations, then check it against the SOHO image (at the top of this page). When you watch it day by day, you can see the sunspots march across the face of the sun from left to right. This is because like everything else in the solar system, the sun rotates too. It takes approximately 27 days for one complete revolution (the equator spins faster and takes about 25 days, the poles spin slower). Save your worksheets and place them in a folder to keep track of your observations. Here's an example of the worksheet after being filled out. Click on it to enlarge it. The current worksheet is slightly different. Thirdly, we hope to do other experiments/activities involving the sun. Some current options are UV reactive beads (lesson plans are available here, here, and here), radiometers, and other things. As it gets more structured, we'll let you know. In the meantime, have fun with what we have here!